"A foolproof oven-baked salmon dish that is easy to make and big on flavor. If you don't like dill, you could try other fresh herbs, or even a mixture of dill, parsley, and spring onion." Combine dill, olive oil, lemon juice, honey, garlic, coriander, salt, and pepper in a small bowl. Rinse salmon fillet under running cold water and pat dry with paper towels. Lay salmon skin-side down on a large piece of plastic wrap. Spread dill mixture all over the top of the fish, wrap well with plastic wrap, and refrigerate for 30 minutes. Preheat the oven to 425 degrees F (220 degrees C). 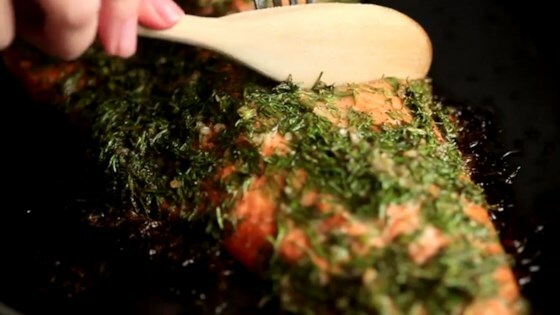 Unwrap salmon and place skin-side down in a baking dish. Bake in the preheated oven until salmon flakes easily with a fork, 12 to 15 minutes.